Server room in data center. Growing demand for networking bandwidth is one of the biggest pain points facing datacenters today. To keep up with increased bandwidth needs, datacenters are transitioning from 10G to 25G Ethernet (GbE). To enable this, IEEE developed the 802.3by specifications defining Ethernet operation at 25Gbps, which was ratified recently. We are excited to introduce the high performance Marvell Alaska C 88X5123 Ethernet transceiver, the industry’s first PHY transceiver fully compliant to the new IEEE 25GbE specification. Availability of standards-compliant equipment is critical for the growth and widespread adoption of 25GbE. By delivering the industry’s first PHY device fully compliant to the IEEE 802.3by 25GbE specification, we are enabling our customers to address the 25GbE market by developing products and applications that meet this newly defined specification. In addition to supporting the IEEE 802.3by 25GbE specification, our 88X5123 is also fully compliant to the IEEE 802.3bj 100GbE specification and the 25/50G Ethernet Consortium specification. 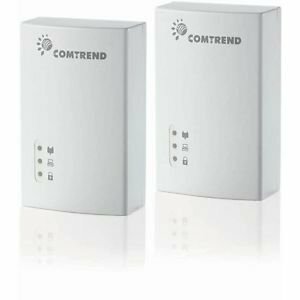 The device is packaged in a small 17mm x 17mm package, and supports 8 ports of 25GbE, four ports of 50GbE or two ports of 100GbE operation. The device also supports gearboxing functionality to enable high density 40G Ethernet solutions, on switch ASICs with native 25G I/Os. With support for long reach (LR) SerDes, and integrated forward error correction (FEC) capability, the 88X5123 supports a variety of media types including single mode and multi-mode optical modules, passive and active copper direct attach cables, and copper backplanes. The device offers a fully symmetric architecture with LR SerDes and FEC capability on host and line interfaces, giving customers the flexibility for their system designs. Traditionally Ethernet has been used in enterprise applications – we are familiar with its use in our office environments. But the IEEE 802.3 family of standards is constantly evolving. Industrial networks present their own set of challenges, and Ethernet with its components are evolving again to address the needs of the factory floor. Connectivity hardware that can offer low-latency, enhanced electrostatic discharge (ESD) protection while operating in extended temperature environments is invaluable to industrial network implementation. The Marvell 88E1510P/88E1512P/88E1510Q family of PHY (physical layer device) products was designed from the ground up in collaboration with leaders in industrial automation and has been vetted for use in the most demanding industrial applications. 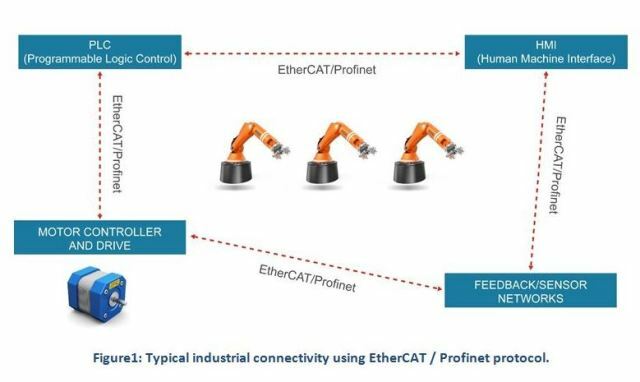 A multitude of communication protocols are used in industrial networks today including EtherNet/IP, EtherCAT, Profinet and SERCOS III. These are independent and proprietary offerings from different vendors. But what they share in common is the goal to deliver real-time Ethernet to industrial automation applications under harsh environmental conditions. The typical elements of an industrial network might include programmable logic controllers (PLCs), motor controllers and drives, sensor networks and human machine interfaces (HMIs). These elements are connected on the Ethernet backbone using a protocol such as EtherCAT or Profinet. The network topology might be hub-spoke (star) or linear. Regardless of network topology, the goal is to provide precise control and synchronized timing information to each of the nodes. If the topology is a long daisy chain, then each node has to perform with the most optimized latency to enable fast request/response cycle times through the system. Looking for a Low-Latency PHY? Protocols such as EtherCAT have to process the Ethernet packet and insert new data into the frame as it passes through in real-time. For real-time applications, this imposes tight restrictions on the latency through the switch and PHY. With this requirement in mind, we designed the Marvell 88E1510P/1512P/1510Q family of PHY products to address the stringent latency needs of tier-1 industrial customers. The table below shows that the Marvell low-latency PHY operates 30-40 percent faster as compared to non-optimized implementations. While the data shown above is the default configuration, significantly lower latencies are possible with register programming. The sum total of transmit and receive latency was less than 400ns across the entire range, as shown below. The small latency variation observed (from min to max) is due to the presence of synchronization circuits in the transmit path. Typically a FIFO (first in, first out queue) is used in the transmit path to compensate for any PPM (parts-per-million) differences between the transmit circuits and receiving circuits. Depending on packet size and the number of entries in the FIFO, a small variation in latency can be observed. (Note: When the PHY is used for precision-time protocol- (PTP-) based timestamping applications, the presence of the FIFO does not affect the accuracy of the timestamps. The timestamps are taken closest to the wire, eliminating the FIFO uncertainty). While 100BASE-TX speeds are sufficient for the majority of factory applications today, there is a growing need to support 1000BASE-T. Since the installation of industrial equipment and networks is capital-intensive, it is prudent to use a PHY device that can future-proof network speed requirements up to 1000BASE-T. The Marvell 88E1510P/1512P/1510Q family of PHY products supports 10BASE-T, 100BASE-TX, and 1000BASE-T. The low latency ranges observed in 1000BASE-T mode is shown below. In an industrial environment, it is difficult to control temperatures on the plant floor, where surrounding equipment may operate at high temperatures and where it can be difficult to provide good ventilation. Industrial motors and robots connected by an Ethernet network often have to weld metals at very high temperatures. In addition to high temperature, industrial environments can also lead to accumulation of electric charge within the machinery. To shield against high voltage surges, the Marvell PHY has enhanced ESD protection circuits. We tested the Marvell PHY in the robust testing environments of some of the largest industrial electronics OEMs who approved the device from an ESD perspective. The Marvell 88E1510P/1512P/1510Q family of PHYs is offered in 48-pin or 56-pin QFN packages. It also offers a variety of host interface options such as RGMII, MII and SGMII. For information on specific features, please review the attached product selector guide. In conclusion, connectivity hardware that can offer enhanced ESD protection, low-latency and operate under extended temperature ranges is gaining popularity in industrial networks. 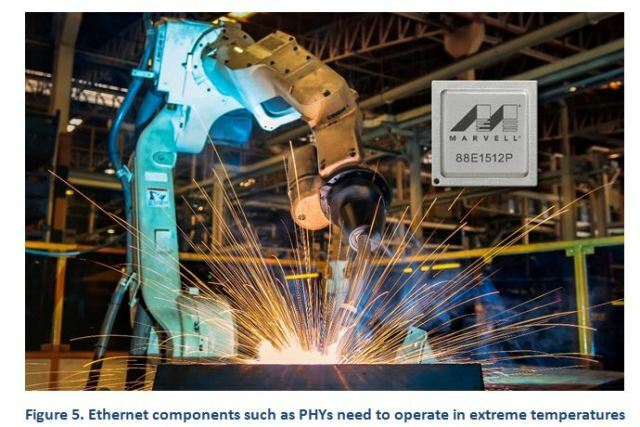 The Marvell 88E1510P/1512P/1510Q family of PHYs offers these key benefits to implement in any real-time industrial Ethernet network. With the availability of high-speed LTE networks and the thrust toward autonomous driving, car companies are working on a structured approach to high-speed data distribution to and within vehicles. Today, Gigabit Ethernet over a single pair of twisted-pair copper wire has become a reality for the automotive industry paving the way for high-speed networking within a vehicle. In November of last year, Marvell delivered the first samples based on the IEEE 1000BASE-T1 pre-standard specification for verification of performance in vehicles. The 1000BASE-T1 standard allows high-speed and bi-directional data traffic over light-weight, low-cost, single-pair cable harnesses. This enables car companies to create a whole new array of exciting automotive features and benefits. Early chip samples from Marvell allow auto makers the ability to evaluate the performance of this new standard and identify possible issues early in the application development process, prior to production, to accelerate time to market. Simultaneously, a number of industry standards organizations are working on automotive-specific wireless standards that will enable seamless internal and external communications with vehicles to enable cloud-based applications. With LTE standards enabling higher than 100Mbps data capability, LTE connectivity will require high-speed links in line with 100BASE-T1 or 1000BASE-T1 Ethernet capabilities within the vehicle, depending on the actual real throughput available to the user from the network. As carrier network coverage and data billing rates become accepted by consumers, cloud-based applications for automotive will allow large data transfers that will enable not only wider infotainment, but concierge and navigation applications, plus remote diagnostics with secure over-the-air (OTA) updates. (Won’t it be nice to know when you’re pulled over on the side of the highway on vacation, exactly what is wrong with your car?) Such mechanisms will also enable security and accelerated fleet management for business and commercial enterprises that can help lower the cost of maintenance, while increasing customer satisfaction by keeping drivers up-to-date with the latest cloud-based data services. Marvell has a history of actively participating in the IEEE standards development process. In 2011, Marvell was a key driver in the Call For Interest (CFI) at IEEE for an Automotive-specific Gigabit Ethernet PHY. This CFI received unanimous support (a relatively rare event in IEEE) and now the new IEEE 802.1bp standard is set to be ratified in 2016. In the meantime, Marvell has already begun sampling pre-standard parts to the industry for testing. The availability of parts has sparked remarkable interest and activity in testing and developing new applications for high-speed Ethernet. Will Automotive Become the Largest IT Employer In the Near Future? The introduction of Automotive-specific Gigabit Ethernet can provide the backbone for enhanced connectivity applications. The automotive industry is rapidly adopting Ethernet as a key enabler, not only for its superior price/performance, but also because it supports the Open Systems Interconnection (OSI) model. The OSI model allows for the rapid deployment of applications and services. Using this layered approach, a specific PHY technology, which met both the light weight and low EMC requirements, had to be developed that was consistent with all the existing upper layers of the OSI model. This gives the benefits of being able to leverage and reuse existing developments in layers above the PHY level. It is amazing to think that with this unprecedented potential expansion of automotive connectivity and its applications, it is conceivable that the automotive industry could become the world’s largest employer of IT experts in the coming years. 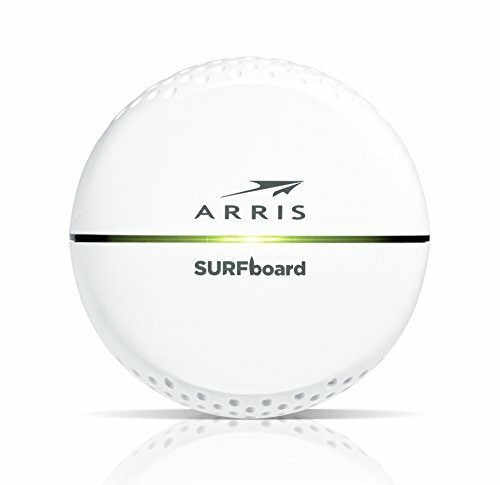 In addition to a long history of WiFi and Bluetooth combo products in automotive, Marvell is enabling WiFi technology to become part of this external connectivity by developing 802.11ai technology that allows for Fast Initial Link Setup (FILS) that provides opportunistic access to base stations whenever they become available as the car drives at high speed. In addition, 802.11p products will enable short-range wireless connectivity for collision avoidance or pedestrian/cyclist detection, applications that demand quick response and are not possible via current Light Detection and Ranging (LIDAR) and LTE technologies. With these wireless technologies placed in the roof of the car, Ethernet plays an important role for high-speed communication to and within the vehicle. By delivering early samples based on the latest developing industry standards, Marvell is helping to “drive” new applications in automotive connectivity technology. 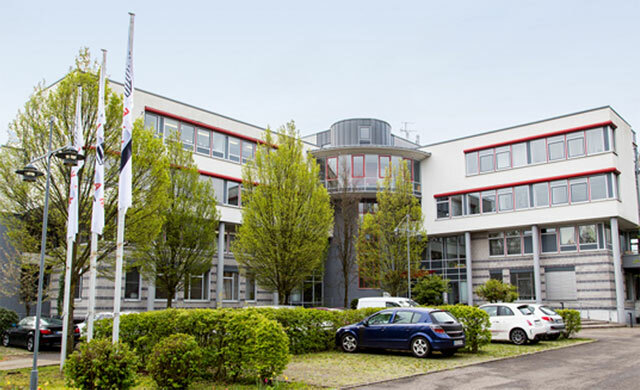 Marvell’s Automotive Center of Excellence, the first-of-its-kind automotive networking technology development center, recently opened in Ettlingen, Germany. Due to the rapid advancement of automotive technological developments in recent years, the next generation of cars needs a new architecture to run a wide array of features—for example, full driver assist, ultra high-definition (HD) displays and over-the-air updates. Marvell’s objectives are to provide access to the latest innovative technologies, (link: http://www.marvell.com/solutions/automotive/), work closely with customers and partners, and drive the automotive industry forward more quickly and efficiently. The grand opening event elicited great excitement, and Marvell was honored to welcome many distinguished guests including Wolfang Erhard, Chief of Business Development from the Mayor’s office in Ettlingen; Klaus Oertel, from Hanser Automotive; Ingo Kuss, from Elektronik Automotive; and Thomas Zimmer from BNN. Philip Poulidis, Vice President and General Manager, Internet of Things, Automotive and Multimedia Business Units at Marvell along with Ian Riches, Director of the Global Automotive Practice at Strategy Analytics provided the keynote speech. 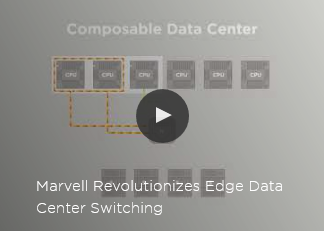 Given Marvell’s history of dedication and innovative design, the company knows that understanding advanced technologies such as, Audio Video Bridging, Time Sensitive Networking and singe pair Ethernet standards—is vital to further the connected car industry. A dedicated team of engineers will utilize their knowledge to expand development and education efforts in these areas with Marvell and its customers to advance the architecture of future, connected cars. The engineering team is responsible for automotive products that include switch, end-node system-on-chips, gateways and automotive software. Marvell continues to market innovative technologies that will shape the future of the automotive industry, and with its Automotive Center of Excellence in Germany is better positioned to drive new automotive designs and technologies forward. With newer, bigger programs and more apps multitasking simultaneously, the answer to making any system run faster, from handheld to super computer, was always just to add more DRAM. . . and more, and more and more. Well, those days will soon be “memory” with Marvell’s introduction of Final-Level Cache™ (FLC™). 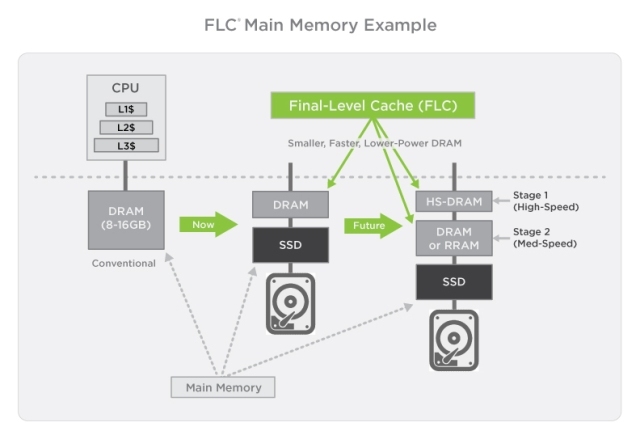 FLC is an architecture that redefines memory on everything from data centers to wearables. By offloading the storage of programs to less expensive solid-state drives (SSDs) and only using a small amount of expensive DRAM to cache the active processes, the amount of DRAM can be cut dramatically along with power consumption. FLC has the potential to spark the development of a new class of lower-cost and lower- power products and cut the DRAM needed in a system by as much as 10x, while cutting the energy consumed to about half what is used today. How? If you look at what’s actually being used on your computer or portable device, only a small percentage of the application code loaded into the main memory is usually active. Take a look for yourself. For example, look at the process monitor in Windows task manager. You will see that most of the applications are idle, yet in aggregate require a significant amount of DRAM space. In fact, nearly 90 to 99 percent of most DRAMs are idle. By using a special algorithm, Marvell FLC can put the most frequently used programs on a small amount of DRAM and the rest onto less expensive, energy-efficient flash memory that can reduce the size, cost and power requirements of anything from a smart car, to mobile phones, tablets, smart watches, computers or data centers. And it works! Our engineering mobile phone platform, shown in this video, uses FLC to play back video smoothly, without any lag or stutter. App switching is also zippy. Such performance is common on mid- or even high-end phones with large DRAM, yet this design used only 768MB of DRAM in the implementation. Time-sensitive streams are mapped to a 512MB non-cacheable area, while another 256 DRAM is used in FLC to emulate 1GB of memory. Hence, it provides similar performance to 1.5GB of main memory in traditional DRAM-based designs. FLC can also emulate larger quantities of main memory. The second proof of concept demonstrates smooth video performance on the same mobile phone platform using FLC. With FLC, better performance can be achieved by reporting to the operating system a larger than physically implemented main memory. The operating system is thus less likely to kill background apps, which is why the fast app switching is possible. The FLC hardware does all the heavy lifting in the background and frees up the tasks of the operating system. Smaller DRAM means less power and lower cost creating endless new possibilities. It will free up innovation in digital design and even accelerate categories like the Internet of Things (IoT.) By offloading storage to cheaper SSD memory, the world can also dramatically reduce overall power consumption and energy needs. For example, a 50 percent reduction in all computer energy use equates to a two percent decrease in rural power needs. Battery life of laptops will be increased, as well as IoT devices that could last weeks before recharging. It changes the future of supercomputers as well. With FLC, you can replace an entire server room with a small portable device. Super computing and computational sets will become faster and more efficient, with future super computers containing tens of terabytes of memory instead of hundreds of gigabytes. 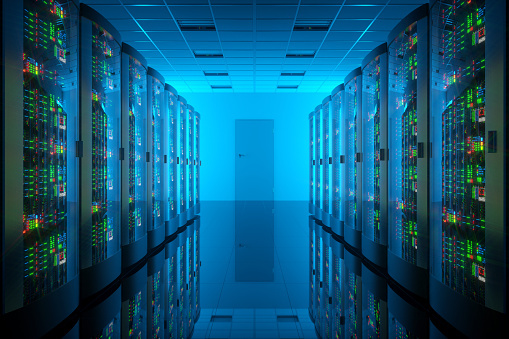 Data center space savings and cooling costs will also be dramatically reduced. This is why Marvell Final-Level Cache represents a monumental technical step forward. Marvell FLC will not only redefine memory–but all of computing.